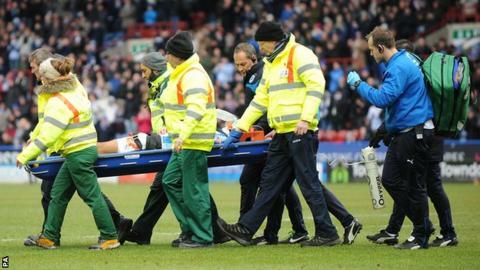 Huddersfield defender Tommy Smith has been discharged from hospital after treatment for a head injury suffered in his side's 2-1 home defeat by Leeds. The 22-year-old was hurt colliding with Terriers goalkeeper Joe Murphy as Billy Sharp scored a late winner for the visitors on Saturday. He was taken to hospital by air ambulance and kept in overnight for observation. "Tommy Smith has been discharged and is now home," his club said. "Huddersfield Town is looking forward to seeing him back in action once he gets the full all-clear!" Following the collision Smith was treated for nine minutes before being given oxygen and leaving the field on a stretcher. A Yorkshire Air Ambulance helicopter landed on the John Smith's Stadium pitch after the game to take Smith to Leeds General Infirmary. After the match Huddersfield manager Chris Powell told BBC Radio Leeds he was "shocked" by the incident. "He was in and out of consciousness for at least 10 minutes," he said.